Other interesting stands I think, which are only there for curtailment purposes, are Yeading / Willowtree Lane, Bushey Heath / Alpine and Bath Road / Nobel Drive. The former looks odd because the stand sits up a little side road and I've never seen anything turn there. Yeading / Willow Tree (GSV) is an interesting turn indeed! The cage is marked out in a very non-standard way. I've never seen it used either. Yeading / White Hart, just up the road, is used fairly frequently. There's a stand off Ruislip Road (GSV), though I believe it's a booked turn in either direction for any routes on Ruislip Road, Church Road, or Yeading Lane. Were a bus to use it, it would block the road - though I've watched dozens of 90s/120s/140s turn here and none have bothered with the faff of going to the stand, always just circumnavigating the roundabout. Thinking about it, it is fairly silly to provide such stands adjacent to roundabouts, particularly out of the way where they require a detour to get to. Are there any examples of these where the stand gets actual use? I go through Ruislip often and see buses (mainly 114 but also seen E7 and 398) reversing into the single bay by the fencing near the entrance to the car park. It got me wondering... at what other places buses have to reverse into bays and how do drivers find having to reverse often like this from their personal experiences. As I type this, I really can't think offhand where else I've seen this in practice at stands, maybe I saw a 204 do it at Sudbury Town, but I think he had OCD and was aligning with the road markings having not got it right first time! Hayes Station (towards New Addington) last stop Hayes Hill Road on Pickhurst Lane. Turn right onto Hayes Hill Road, Tiepigs Lane, Left Bourne Way then start from Hayes Station. This turn is no longer official by the union as i suspect the blinds saying Hayes Station are misleading. Elmstead Woods - Towards Eltham last stop St Keverne - No longer official by the union due to it being tight to go round side roads to turn around. Southend Crescent - Towards Eltham last stop Footscray Road/ Southend Crescent, 1st exit roundabout onto Footscray Road then right onto 126 stand or 124 stand (optional) 1st stop Halons Road. 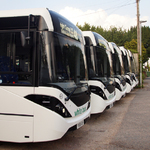 Thats the official turn but iBus expect buses to turn around on the roundabout. If you're talking about walk-in-the-park reversing, then Barking town centre stand & Peckham bus station seem fairly straightforward. One I find perplexing though is Tooting Broadway with a stand in the middle of the road. It takes some fancy steering wheel action to get that bus to align in the cage; however I see some drivers not bother and stand nearside the road. Tooting Broadway stand has always been problematical with regular complaints from local residents, I suspect this was the main reason for extending the 264 to St Georges Hospital. When I was a kid it was a popular turn on a Saturday, when all the shopping centres on the A23 were busy. Nowadays it's usually a street or an 'official' paved bus stand. Photo from "Sunday Service" by Jim Blake Regent Transport Publishing. Thanks! 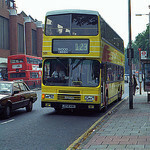 Didn't know about Tooting Bdy but have driven past there and saw the 264s kerbside... this was a while ago now though. Now I think about it I often see buses at Hammersmith bus station have to reverse into bays in front of other parked buses... d'oh! 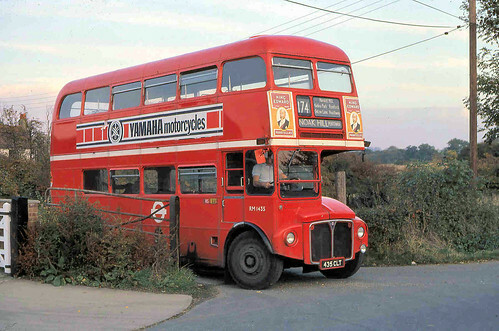 If it's the photo I'm thinking of with an RM reversing into a field I think it's Noak Hill Pentowan on the 174. That Bexley Hospital photo brings back some memories. Sid, yes thanks for that, but I've Still to find the photo!